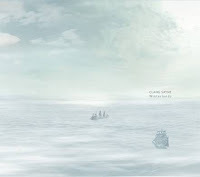 We receive many unsolicited distribution submissions at Baked Goods, and Winterlands by Clang Sayne turned up late last year in our postbag with no fanfare or self-aggrandisement – which is a great shame, because this is an album that really needs to be heard. Imagine Tim Buckley’s Starsailor and Lorca band with Julie Tippetts channeling Tim’s drama and languor; imagine Beth Gibbons backed by Comus featuring Blixa Bargeld on guitar; imagine Sandy Denny at her most fervent joining the sessions for Mark Hollis’ solo record…Winterlands sounds like all of the above and none of the above, an extraordinarily idiosyncratic conception in its own right, and as oblivious to the restrictions of genre as all of the artists mentioned. Clang Sayne are songwriter and founder Laura Hyland (voice and acoustic guitar), James O Sullivan (electric guitar ‘and objects’), Peter Marsh (plucked and bowed double bass) and Matt Fisher (percussion), and Winterlands was recorded live in single takes over 3 days of recordings, without edits or overdubs. The band have all played in jazz and improv in the past: Laura began singing in Dublin in the late 90s before moving to London, O Sullivan is guitarist with sound improvisation group TETRAS, Peter Marsh has played everything from industrial avant rock to Breton folk music, and Matt Fisher recently performed with the Steve Waterman Quartet. The lyrics are either Laura’s own or settings of literary texts as varied as Anais Nin, Dorothy Parker, William Stafford, and an anonymous 8th century Japanese poet. But this seemingly ‘serious’ background gives no hint of the sheer joy in playing these four musicians enjoy – there is an organic wholeness throughout that belies their basis in improv, every note demonstrating a confidence and a control that is deeply self-assured, while never either dry or ‘difficult’. Each song occupies its own very self-assured world, and each track is essential to the overall pacing of the record as a whole. These are definitely songs, despite their literary basis, and any knowledge of the latter is not necessary to respond to Winterlands on a purely visceral level. Winterlands was initially released quietly last year, and ‘A Death And A Vision’ featured on the Wire Magazine’s October 2009 Wire Tapper CD; Baked Goods are proud to be able to present this album to the larger audience it surely deserves. This is an album that could have been recorded at any point between 1969 and the present day, music that transcends the background of its contributors or any expectation a listener might bring. What can seem formless can suddenly coalesce into a riff, a rhythm or a melody, and then head off into other planes of there, while still retaining an understated or unstated wholeness; Laura’s voice can whisper, soar, hiss or click, but never deviates from the discipline and the focus that Clang Sayne demonstrate throughout. This is simply wonderful and exciting music, constantly surprising, and ultimately an affirmation of the indefinable power of pure music and musicianship to take the listener to a whole other place.